It started like any other day. Wake up, make breakfast, pack lunches, check email and Facebook and blogs, get everyone dressed and start our day. It was the rare sort of day where everything was running smoothly. I drank my coffee hot, the kids played peacefully and I started to feel nervous that it was a calm before a storm. Something was going to shake up this perfect day. I could feel it. At 9:30 I was going to rendezvous with a new friend. We’d been texting the night before, setting up our meeting, and I have to admit, I was part excited and part nervous. I pulled into the YMCA, as I do several times a week, but this time with a little more trepidation. All of a sudden my workout pants from Costco were embarrassing. I found a stain on my shirt and was horrified. What was I thinking meeting someone like this? Had I become that complacent Mom that doesn’t care at all? So comfortable with my partner that I stopped even trying to impress them? And then I saw her. My new Mom friend. We’d flirted over the summer when we met through a mutual friend – my youngest and her only child just weeks apart in age. There had been attempts to meet since then, but it had always fallen through. And then she joined the YMCA, because I’d told her it’s the best place on earth. We dropped off our kids in the play area, and made our way upstairs to the treadmills. She apologized for her leggings – nothing special from LuLuLemon, heck, not even actual athletic wear. I laughed and pointed at my stained shirt. We got on the machines and I was sure she was going to quickly set her pace to a brink 10 minute mile. We both heaved a HUGE sigh of relief when we mutually confessed that we were more 18 minute mile walkers. The next 50 minutes passed in a breeze. We commiserated about husbands, being stay at home Moms, and the conversation was so comfortable and natural. Our time nearly up, we went downstairs to get our girls, making another date later in the week. I left with a new friend and a smile on my face. And then I thought about Jaymi. And I felt dirty. 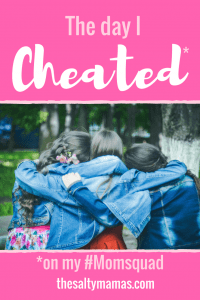 Had I just cheated on my SAHM workwife? I mean, we weren’t exclusive. We’re free to see other people. But most of my other Mom friends? Are also Jaymi’s friends. So it’s different. This was stepping outside of our #Momsquad. And I wasn’t sure I liked it. But I did like my new friend. Like, a lot. And I wasn’t ready to just let her go out of allegiance to my other friends. And I wasn’t. But I know that in this #momlife we need as many people in our lives as we can that will back us up, keep us in check and tell us it’s okay when we’re the Mom at the park with a purse full of free Chick-Fil-A when all the other Moms are serving up pumpkin seeds. So yeah, I’m a cheater. And I couldn’t be happier with my wife and my mistress.